Do you check your emails on holidays? 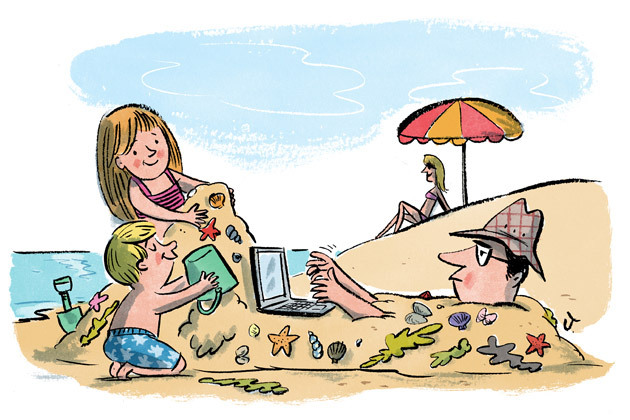 The big dilemma – when you are on leave should you even dare to check your emails? I was always of the view that during this precious time you owe it to yourself to totally wind down, refresh your mind, forget totally about work. I believed that checking emails or ringing the office to see how everything is going would make this necessary rest impossible so it should be totally avoided. My big fear was that one email could totally ruin my day and switch my mind onto work so it was better to totally avoid this from happening. I did this for years quite diligently but now I find that it is better to quickly check my emails every day while I am away. This is easier because I know we have a great team that we can trust with anything so if something does crop up I am happy to forward on any issues to them knowing they will be sorted, so it never ruins my break. The problem is do I really get to switch off fully this way and does peeping at those emails ruin the benefit of the break? Let’s look at the email dilemma in detail..
Reasons why you should avoid checking your emails? Reasons why you should check your emails.. In truth I don’t want to get dragged into any issues and break from my ‘switch off‘ but I do feel its an easier way of dealing with a backlog and if necessary I will delegate any important things as they occur. I justify this approach as it is my business but I genuinely wouldn’t want any of my crew checking their emails when they are off – I want them to take their well deserved breaks, which is good for them and for the business. This entry was posted on May 27, 2014 at 5:33 am and is filed under Holidays, Personal development. You can follow any responses to this entry through the RSS 2.0 feed. You can leave a response, or trackback from your own site. I am a self employed photographer and I get email enquiries for work all the time. It is very important that I reply asap so that I don’t lose the potential job, so I do check my emails several times a day, even when on holiday. It also allows me to clear away the unimportant emails so that I don’t have tons to wade through when i get back home. Thanks for presenting the other side of the argument Dermot – answering those emails could pay for the next holiday ! 1. Yes, it is your business but it will not collapse if you are away for two weeks. If it has that potential you have planning/staffing issues. It will happen regardless! Perhaps use your email client more effectively. Before going away prioritise the email addresses that are most important in the next 30 days ! When you do log back on they are at the top of the list and you won’t have missed anything. 3.Unless a dire emergency (the place catches on fire, we are being held at gunpoint) your team should be able to handle any circumstance; that does not require your physical signature. Even in that instance; there are alternatives either digitally by fax or by-proxy all viable and effective solutions. 5. Nagging worries are a personal issue. Framed in not being able to either trust life or yourself. However based upon length of holiday,if you MUST keep up. Do so on a aggregated response schedule. ie.. if you are gone for 2 weeks check the email only 2xs during that period. If any SERIOUS(pre-define serious before you leave) issues come up they can call you. Even tell the staff what days you will be checking your email so if any issues occur they can be moved to the top when you log in with a red flag to make you aware of their urgency. *When you set your out of office reply it is always a good idea to give details of someone in the office who can address any issues they may have. Most of the time people are simply looking for validation on progress. And it doesn’t really matter where it comes from. I will be away from such and such date please refer all your queries to fabulouspersonincork@fuzion.ie so he/she can assist you..
See it’s easy when you simply breath. thanks for the really great and helpful reply – some fab tips there Jenni. I must go on another holiday and try them out!! Do that! Porto is nice and thy have Port! I’m pretty black and white on this. A holiday is about switching off so no phone calls and no e-mails. Not even for a few minutes because you will be thinking about this stuff as you go through your day (it’s impossible not to). There is an easy solution to this. It’s the ‘Out of office’ auto-reply. If you e-mail somebody and you get a message back saying they are on holiday, you don’t expect them to reply, do you? Deep down, we all like to think we’re indispensible but hate to break it to you – you’re not and I’m not. If you ever hit by a bus tomorrow and ended up in hospital for 2 weeks, do you think the office would run ok without you? I don’t quite get that you expect staff to switch off but you can’t!! Do you not deserve to switch off too? Next time you’re going on holidays, tell your staff and customers you’ll be away for a week/2weeks and bet nobody will have an issue with it. This isn’t about your business. It’s about our feeling of being indispensible and not being kind to ourselves that we deserve a full break. p.s. this feels like a rant but it’s not – just a different perspective. Great perspective Neil …I know you are right ! Exactly the same as you Greg! What can we do Eamon? As a business owner I see the sense of checking. However, a holiday is only a holiday if I forget totally that I have a business. This is necessary for both physical and mental health. So my answer is no. I will never check. If someone dies I CAN be contacted. Well done Pat – I know you are right but haven’t been able to resist !